This is one of our favorite, favorite, favorite ways to raise money and awareness for dog rescue. In early 2016 we ran a contest with our adopters and followers. You submitted photos and we selected our top six pups and they got their own wine bottles. Buy a bottle and help our rescue. Choose from the Carmenere, Malbec, Cabernet Sauvignon, Merlot, Chardonnay and Sauvignon Blanc. Or... you can create a custom package. 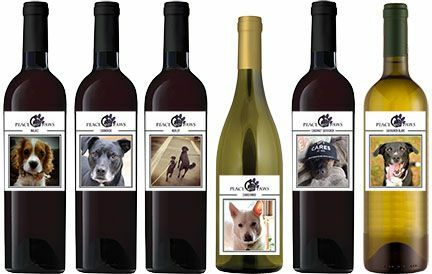 CLICK HERE or on the bottles above to visit Peace & Paws Vineyards and get your bottles of joy.